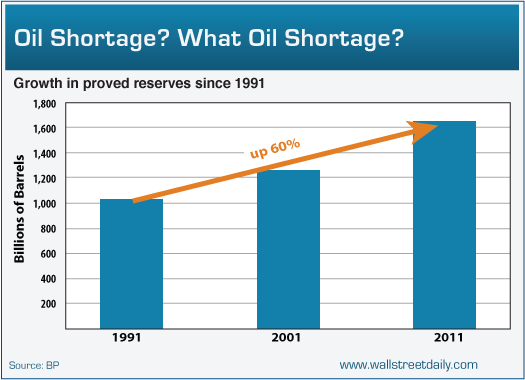 The above graphic demonstrates that global oil reserves continue to grow at at a steady rate. As economical and clean methods of unconventional liquid fuels continue to be developed and perfected, potential reserves of all liquid fuels will rise even faster. 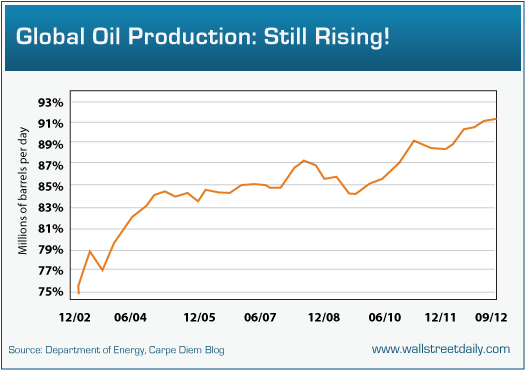 Global oil production is also rising, as a reflection of increased prices due to emerging world demand. At the same time, demand for oil from the advanced world is declining. The Bakken oil basin in North America is one of the reasons why US oil production is shooting upward -- at the same time that oil demand is declining in the US. 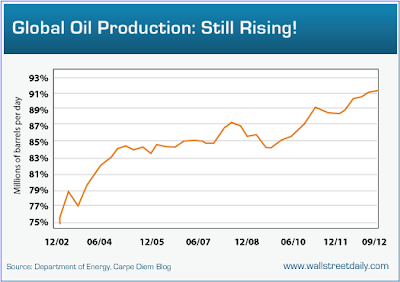 Some think that Bakken is on the way to being a "supergiant" -- producing over 1 million barrels of oil per day! At the moment the industry has completed just 5,000 wells in the Bakken at an average spacing of less than 1 well per 1,280-acre unit. But Continental estimates the core could support up to 52,000 wells with four to eight wells per 1,280-acre unit for full development. ...Conventional super-giants such as Ghawar may never be discovered again, although exploration is pushing into new areas offshore and in the Arctic. But that may not matter if oil and gas can be wrung from more commonly occurring continuous deposits. Peak oil is a trivial truism. But "peak oil doom" is a form of brain rot, for people with nothing important to do but killing time for the rest of their lives. Try not to let it happen to you or someone you love.